It seems I have lost the ability to bake. In the past five hours I’ve attempted to make vegan cornbread and blueberry scones, as well as chocolate chip scones. Yet, all I’m left with is a terrible mess (three times over) and a trash can full of baked goods that didn’t actually end up tasting good. I made this watermelon kale salad for dinner tonight. I thought that cornbread would be a great starch to pair it with (little did I know how it would turn out). I subbed white unbleached flour for white spelt flour and while the corn muffins rose, they did not taste delicious (or even edible really). I’m blaming that cooking catastrophe on the spelt flour, which I’d used once before for baking biscuits and I was left with that same horrible flavor (maybe it had spoiled?). The second and third baking mishaps were a mystery to me. I made the same scone recipe I’d made a thousand times before (or maybe at least a handful of times), but the “scones” (if you’re nice enough to call them that) came out perfectly flat. They looked like puffed up cookies. They’d spread so far the edges started to cook together to form one massive mama scone that looked reminiscent of Swiss cheese. As there were lots of holes in areas that didn’t manage to touch. I thought maybe the first batch was ruined by the frozen blueberries, but the second batch came out the same way. They were practically brown on the outside and yet they were flat and overly soft on the inside. The taste was not overly appealing either. I even told myself to stop after that first batch of scones. I knew they’d turned out terrible and that wasting double the ingredients was bad enough, but I guess the third time is a charm (really it was for me and my garbage baked goods). At this point, I’ve officially given up trying to bake dessert tonight. I’ve surrendered to my possessed oven. I’m assuming it’s the only reason for all of the unsightly baked goods that have come out of it tonight. It’s also hot, 10 pm, and I’m beginning to get tired eyes. For tonight, the oven wins, but I will surely make another batch of my favorite scones at some point. I do apologize that none of this post actually had to do with the watermelon and kale salad recipe which you will find below. It was delicious and did not end up in the garbage, as everything else has tonight. After washing the kale, dry it and then give it a rough chop. Add it to the serving bowl. Sprinkle the quartered sungold tomatoes on top of the kale. Then mix the cucumber and watermelon together and add that to the salad as well. 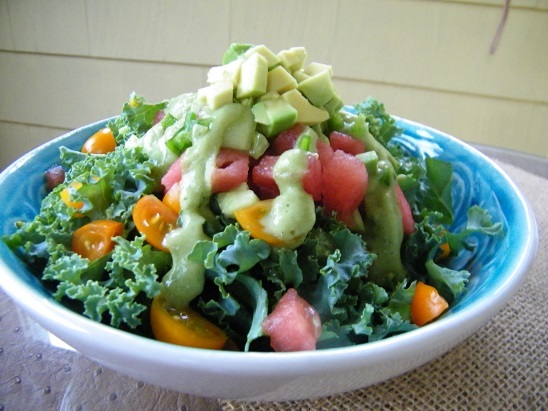 To finish the salad, sprinkle the jalapeno pieces on top, drizzle on the cilantro lime dressing, and finally top with diced avocado pieces. Add all of the ingredients (starting with 2 tbsp of water) to a small food processor and blend on high until the dressing is smooth and creamy. If the dressing is still too thick, add another tablespoon of water to the food processor and blend again. Add it to the top of the kale salad and enjoy immediately. Thank you so much! I appreciate the feedback. I also agree that substitutions can definitely throw a baker off. Baking is more of a science, which I’m still trying to figure out. Well the salad looks good! Mmmmm…Thanks so much for this recipe! I made it for my husband’s and my lunch for this week and it is divine! We both especially loved the dressing and will make it again!